Partners NASA and Boeing sought a disruptive innovation in tooling to support their development of a significantly lighter-weight space-flight propellant fuel tank. Tapped Janicki’s expertise in designing and manufacturing advanced composite tooling that goes beyond existing technologies. Extremely innovative approach to the use of advanced composites in space flight structures. Propellant tanks for the launch vehicles have typically been made of aluminum. Composite tanks have the potential to significantly reduce the cost and weight for heavy-lift launch vehicles and for other future in-space missions. Janicki has designed and fabricated a 2.4-meter-diameter concept test tool. This composite tool has been used to make the largest composite propellant tank ever produced using out-of-autoclave processing. Boeing produced the composite tank, which is now undergoing testing at NASA’s laboratories. Janicki has just complete manufacturing a 5.5-meter-diameter tool that is scheduled for part production by Boeing, and testing by NASA, in early 2014. 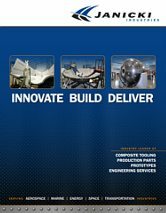 Support out-of-autoclave process to produce the composite tank. Breakthrough project for all three collaborators. This entry was posted in Press Releases on February 15, 2013 by fdgadmin.